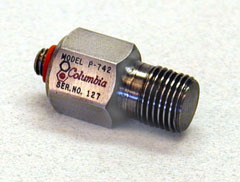 The Columbia Model P-742 High Intensity Acoustic Sensor (Microphone) is designed for the measurement of high level dynamic pressure events, including high intensity sound pressure levels, over a frequency range of 2 to 10KHz. It may be used at temperatures up to +150 Degrees C.
The all-welded case construction of the Model P-742 provides the advantages of very high natural frequency and exceptional mechanical isolation along with extreme ruggedness. This flush diaphragm device conveniently mounts with a 1/8" male pipe thread. Consult the factory for customized versions of this sensor.